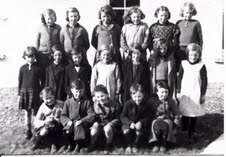 Maureen remembers her school days in 1930s Milltown, County Kerry in this poignant and extremely topical story. Recognize anyone in Maureen’s fifth-grade class at Presentation Convent in Milltown, County Kerry? See our contest at the end of the story! Soon after my father, Timothy Teahan, was hired as the convent gardener, the sisters heard he had a little girl at home. They were very anxious to meet me. One of my first memories was of standing on their kitchen table surrounded by about nine black-robed nuns. As they admired me in my little white fur coat, I didn’t know what to make of them in their old-fashioned habits with the starched linen wimples and heavy wooden rosary beads. Were they people? I had never in all of my two years seen anyone like them in town. I went home feeling very uncomfortable about the whole experience. Not long after that I started school, probably on the sisters’ insistence. They asked my Daddy to give up smoking his (Wild) Woodbine cigarettes, offering to take his two pence (for five smokes) and save them for my future. Apparently, the funds would pay for my University education. I don’t know why they saw so much potential in me. Perhaps it was because my grandfather, Daniel O’Meara, used to visit a very old nun at the convent who I believe was the sister of his first wife. She used to give me gifts, one a black, velveteen drawstring-purse of all things! Beginning on my first day of school, my teenage neighbor, Ina, took me there. I was much too young to walk the few steps from our home to the school, and Mam was busy caring for my younger siblings. Just about that time the one-room Protestant school, run by Miss Day, was closed due to lack of pupils. When it shut down, two very nice brothers transferred to our school. Of course, they were excused from religious instruction-Catechism. We weren’t discouraged from being friendly with the new pupils, but we were told not to get close as they may try to convert us. We were taught we had “the one, true church and no other people would go to heaven-salvation was ours alone” Of course, they were just as religious as we were in their own way. What a shame it was all in vain! The Protestant church had a hidden garden, down large slates steps opening onto a big field of bluebells-my secret garden. I brought the flowers home for Mam’s bedroom shrine for St. Mary, but I never told anyone where I found them. She had placed a lovely green mantle cloth embellished with contrasting embroidery on their bedroom shelf with a statue of the Blessed Virgin. Now I wonder if it had been set there to protect her and babes in childbirth. Also, around this time a decision was made that any boy under seven must attend the Convent School, not the Monastery School, as had been the tradition. They came sobbing, in fear of name-calling from the older boys. They did settle in, but the old nuns couldn’t handle them as they carried on. They were not at all well-behaved, unlike most of the young girls. One day, two of them were so rambunctious the sisters decided their punishment was making them stand between me. I happened to be wearing a blue dress and one of them whispered in my ear, “You’re a blue-shirt.” To this day I’m not sure just what he meant, but it was certainly an insult. Another time the same boy was so badly behaved one sister declared he would hang-the ultimate insult! Her dire prediction never came to pass. Much later, we heard the scoundrel became a Providential Policeman in Canada. The sisters could be hard on the girls, too. When one little girl came to school in a new dress, the nun examined the fabric closely and remarked that it was so flimsy that one could sift meal through it. Since she came to school so proud of her new frock, the withering comment must have crushed the poor girl’s spirit. One of the elderly nuns was so eccentric that every day she examined the soles of all our shoes, looking for rubber. She so disapproved that if you were unfortunate enough to be wearing the forbidden footwear, you had to remove them and place them in a basket until school was dismissed. She believed that the rubber drained our eyesight. It didn’t matter how damp and cold it was, the student had to sit in stocking feet all day. I doubt these children went home and told their parents, as the sisters weren’t crossed in those times. These old women were so far removed from the outside world they just didn’t understand how they hurt the little children. But the nuns met their match in my younger sister, Joan. Even at a tender age she was a force to be reckoned with. I’ll never forget the day my sisters Kitty and Joan, along with a few other girls, committed a serious infraction of the rules just before closing prayers. They were “benched” against the back wall, sitting over the dreaded basket of shoes. Suddenly, Joan, followed by Kitty, made a break for the classroom door! Kitty was pulled back in, but Joan escaped-the old nun in her cumbersome habit and layers of petticoats just couldn’t catch her. Joan ran the length of the schoolyard-with the exasperated sister in hot pursuit! When she passed through the massive door, Joan knew she was safe. But that wasn’t enough for her. She turned and defiantly waved goodbye. It took about three weeks of much cajoling and coaxing from father and grandfather before Joan finally returned to school for more misadventures. OK. Now it’s your turn. Can you name any of the students in this 1937 photograph of the fifth-grade class at Presentation Convent School in Miltown, County Kerry. Leave a comment and help us put names to the faces. 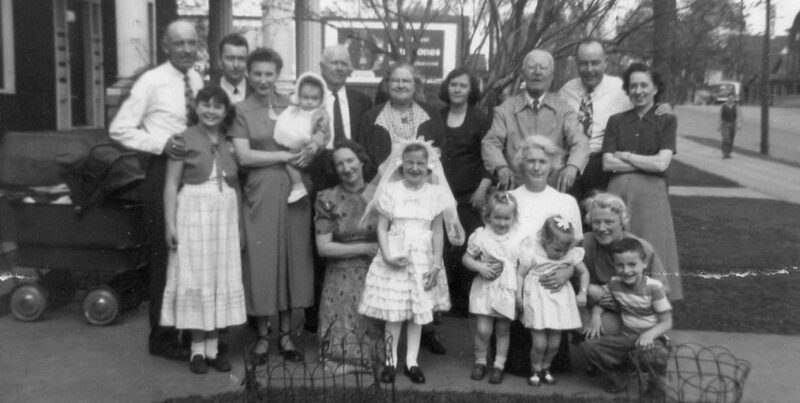 Maureen and Joan Teahan are two of the girls…who are the rest? Don’t be shy…leave a comment if you can help! Categories: Maureen's Memories | Tags: Kerry, Milltown, nuns, Presentation Convent, school days, sisters | Permalink. Re 1937 school photo.In the middle row are the Butler twins.Joan is in the centre and Cait on the far right. I grew up in Miltown and both were neighbours of mine. Mary Riordan, Clounmore, Miltown and Tralee. P.S. Enjoying your stories immensely. Thank you, Mary. Delighted you’re enjoying the stories. Maureen remembers you and your family very well. Your great aunt, Kate Riordan, was the registrar of births and was Dr. Sheehan’s receptionist. Wondering if we can find Maureen’s 1930 or 1931 Infant’s Class photo. In the front row was a girl named Bridie, also the two Dowling sisters, Crissie Quirk Sullivan and Marie Stephens. Another is on its way! Love Maureen’s stories! I am currently living in Milltown Co.Kerry and found your your story fascinating. All my children are attending the primary and secondary schools in Milltown. I would hope to get in touch. I am so happy you contacted us! It is great to hear from someone in Milltown. I will send on your email to Mary, Maureen’s daughter. Have you read the rest of her stories on the blog? Susan – I wish Maureen was my Aunt! We are honored that she is sharing her wonderful stories through the blog. I look forward to each one and am so impressed with how beautifully each one is written. Her stories are pure gold! What a lot of great anecdotes! The gardener of the convent. Bluebells from the Protestant garden. And the best warning: Rubber drains the eyesight! Ha! I’ve never heard that one. A winsome portrait of being brought up Catholic, whether you wanted it or not! I just love Maureen’s stories! Have a wonderful weekend, Mariann. Has Spring come to where you are? The weather in Minnesota is finally showing promise! Yes, thanks! We have the weather in the 50s just this week! I’m thinking garden-garden-garden . . .
What can we say…it’s complicated!